This 6 oz. pewter flask has a Claddagh engraved on the front. It comes with a small funnel, to insure you don't spill a drop! 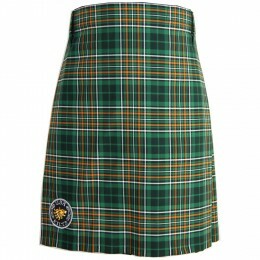 At USA Kilts, we will gladly tell you that all of our products are made in Scotland, England, Ireland, Wales and the USA. All of our kilts are made to the highest standards in the USA (by our staff) with materials from Scotland, England and Wales. We proudly support fair trade practices and promote Celtic traditions by offering products made in Celtic countries by Celtic artisans. The Claddagh's distinctive design features two hands clasping a heart, and usually surmounted by a crown. The elements of this symbol are often said to correspond to the qualities of love (the heart), friendship (the hands), and loyalty (the crown). This product is generally kept in stock at all times and is available for immediate shipment.